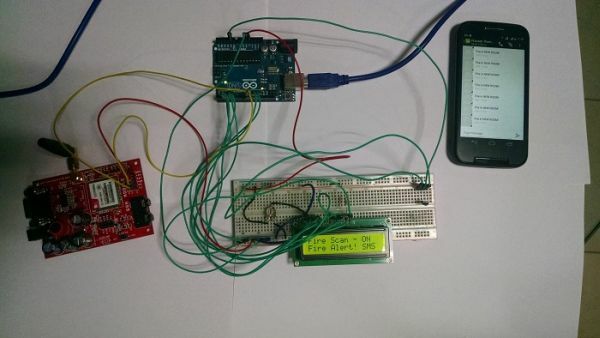 Recently we have learned how to interface GSM Module with Arduino and send/receive SMS using GSM module. Interfacing any device with a micro controller is the first step to building a useful system or project with that particular device. In this tutorial, we are going to build a very interesting project – a Fire Alarm System which will send SMS to a set of Mobile Numbers when fire occurs in a particular location. We have seen many typical Fire Alarm projects which will alert with a siren or an automatic shutdown mechanism. This fire alarm project make use of modern communication technologies to deal with emergencies. Note 1:- I suppose you already know how to deal with temperature sensor LM35 and you know how to interface GSM Module with Arduino. Please read and learn those two articles before going ahead. Note 2:- You may also read Digital ThermoMeter using Arduino which will help you learn more about LM35 and Arduino together.